Samajwadi Party president Akhilesh Yadav blamed Saturday’s violence in Ghazipur on Chief Minister Yogi Adityanath’s “thok do” policy. Speaking to reporters in Lucknow on Sunday, the former Uttar Pradesh Chief Minister slammed his successor for the deteriorating condition of law and order in the state. “Ye ghatna isliye ghati hai kyunki CM sadan mein ho ya manch pe ho unki ek hi bhasha hai ‘thok do’ (This incident took place because the Chief Minister, whether he is in the Assembly or on a stage, only talks about violence),” Yadav was quoted as saying by ANI. “Kabhi police ko nahi samjh aata kise ‘thokna’ hai kabhi janta ko nahi samajh aata kise ‘thokna’ hai (Sometimes the police doesn’t know who to beat up, other times the public doesn’t know who to beat up),” he added. Yadav said that the stone-pelting incident, which claimed the life of a policeman, was a failure on the part of the administration. “The administration and the intelligence department knew who is protesting and where. Despite this, the unfortunate incident took place,” he claimed. On Saturday, Congress leader Randeep Singh Surjewala equated BJP rule in UP to mob rule. In a tweet posted in Hindi, Surjewala said that neither the people nor the police are safe in “Adityanath’s jungle raj”. Recalling the killing of Inspector Subodh Kumar Singh in Bulandshahr by a mob, Surjewala said that the UP CM had dubbed it “an accident”. आदित्यनाथ के महाजंगलराज में न जनता सुरक्षित है,ना ही पुलिस! इसके पहले इन्सपेक्टर सुबोध कुमार सिंह की भीड़ ने हत्या की,जिसे CM ने ‘दुर्घटना’ क़रार दिया! 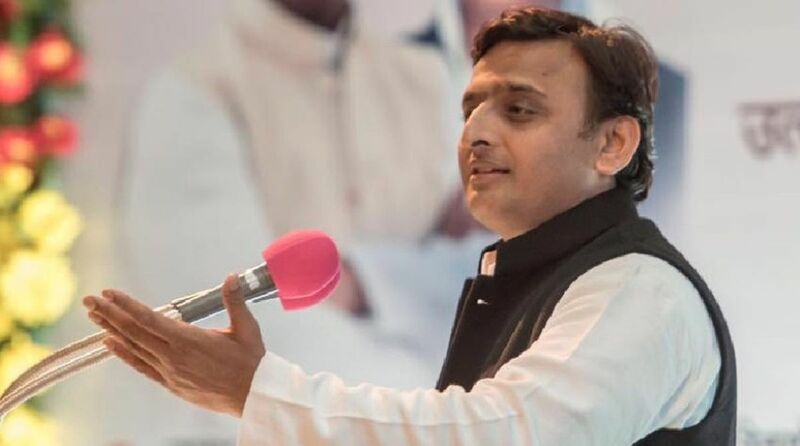 “And, while levelling allegations against the state government, Akhilesh Yadav must peep inside himself, as the SP and the NISHAD party are in alliance with each other,” he was quoted as saying by PTI. Tripathi added that all the possible angles in the case will become clear in the probe. A constable, Suresh Vats, died and two others were injured in stone-pelting allegedly by Nishad Party workers near Atwa Mor police station in Naunera area of Ghazipur on Saturday. The incident happened after on the day Prime Minister Narendra Modi addressed a gathering and laid the foundation stone of a hospital in the district in the presence of Governor Ram Naik and CM Adityanath. Reports say that the PM had left the venue before the incident took place. Police registered an FIR against 32 people and 60 unnamed in connection with the death of the cop but has so far arrested 19. ADG Varanasi zone, PV Rama Sastry said that the reason of death of the constable, according to the CMO, is head injury. OP Singh, DGP UP, expressed grief at the death of the constable in a tweet and assured strict action against the persons involved in the violence. “The death of Head Const. Suresh Pratap Singh Vats in Gajipur in stone pelting is extremely tragic. So far 19 accused in 3 cases have been arrested, which include 11 in the case of murder. Strict action will b taken against those involved in violence under stringent sections of law,” he tweeted. The death of Head Const. Suresh Pratap Singh Vats in Gajipur in stone pelting is extremely tragic. Meanwhile, VP Singh, son of the deceased constable, accused the police of failing to protect his father. “Police is not being able to protect their own. What can we expect from them? What will we do with compensation now? Earlier, similar incidents took place in Bulandshahr and Pratapgarh,” he was quoted as saying by ANI. This is the second time in less than a month that a policeman has been killed by a mob in Uttar Pradesh. On 2 December, Inspector Subodh Kumar Singh, the SHO of Syana police station, was shot dead while trying to stop a rampaging mob. Prashant Natt, one of the prime accused in the killing of the cop, was arrested from the Bulandshahr-Noida border on Thursday afternoon.